Blood sucking flies are naturally attracted to warm blooded animals such as horses. Horse manure also attracts lots of flies because it is the ideal place for flies to lay their eggs. 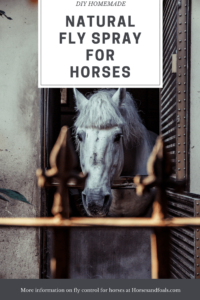 What can you do to keep flies off your horses and out of your barn? You may think that you have no choice but to use chemical sprays, but there are a lot of downsides to this solution. Repeated exposure to pesticides is not good for you, your horse or the environment. When you spray a chemical fly spray on a horse, there is always a lot of overspray. This can get on your clothing and skin, in your mouth and in your eyes. It can also kill off beneficial insects in the surrounding area and cause damage to bird populations. If you reduce your natural predator population, your fly population will naturally increase. 2 What If You Don’t Have All The Ingredients? There are lots of recipes for natural mosquito repellents for people online. Would something similar work for horses? Here is a good basic recipe for fly repellent for horses. It relies on essential oils just as recipes for humans do. Combine the ingredients in a 1 quart spray bottle. Add the vinegar last and just fill the bottle. If you are using a quart bottle of vinegar, you’ll have a bit left due to the presence of the other ingredients. Mix the ingredients by shaking vigorously, and remember to do this before every application. What If You Don’t Have All The Ingredients? Note that some recipes call for apple cider vinegar (ACV), but this is really not a good idea because ACV actually attracts some kinds of flies. The vinegar is just a carrier for the oils. It is not an active ingredient. Inexpensive white vinegar will work fine. If you don’t have that, a mixture of water and rubbing alcohol or drug-store variety witch hazel will work, but vinegar is a bit less drying. Some recipes call for extra virgin olive oil (EVOO). This is also wasteful and a bad idea. This expensive oil solidifies at cool temperatures and is likely to clog your spray bottle. Use a light, stable oil such as grapeseed oil or even baby oil. The dish soap acts as a surfactant so that all the ingredients will blend smoothly. Don’t use the kind that has bleach alternatives or oxy-cleaning power or anything else. Just get plain dish soap. If you prefer, a plain liquid castile soap will work just fine, too. If your mixture seems to frothy, experiment with reducing the amount of soap. A half or even a quarter of a teaspoonful should work fine. 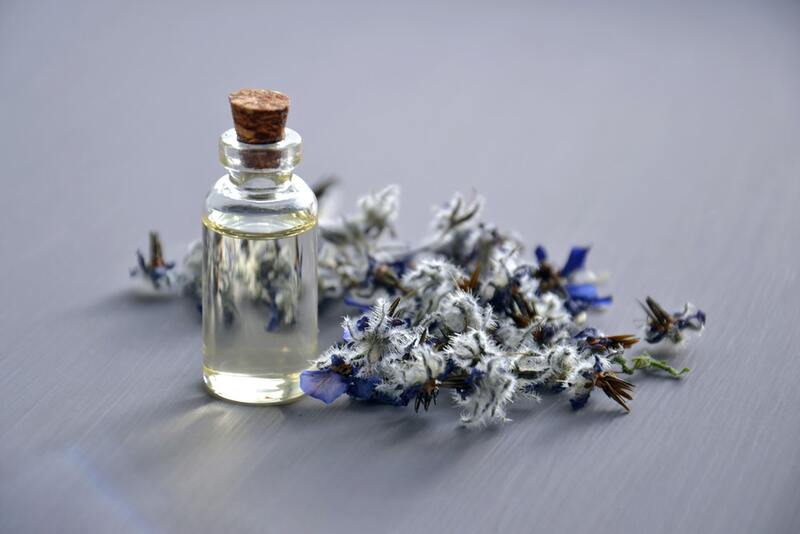 If you do not have the essential oils listed, you can substitute eucalyptus, tea tree oil, lavender or lemongrass for the oils you do not have. Do not use oil of oregano as it can cause severe burning sensations and may even cause hair loss. Peppermint oil may also cause sensitivity. Be watchful for this and substitute a milder oil such as lemongrass if your horse seems irritated by your recipe. Note that this recipe calls for 20 drops of each of three oils. That’s 60 drops altogether, which equals one teaspoonful. A teaspoonful of lavender or eucalyptus oil alone could be used in place of any mixture. Both of these have powerful insect repelling properties. As a bonus, if your horse tends to be excitable, oil of lavender has a very calming effect and is often used as aromatherapy for anxious horses. 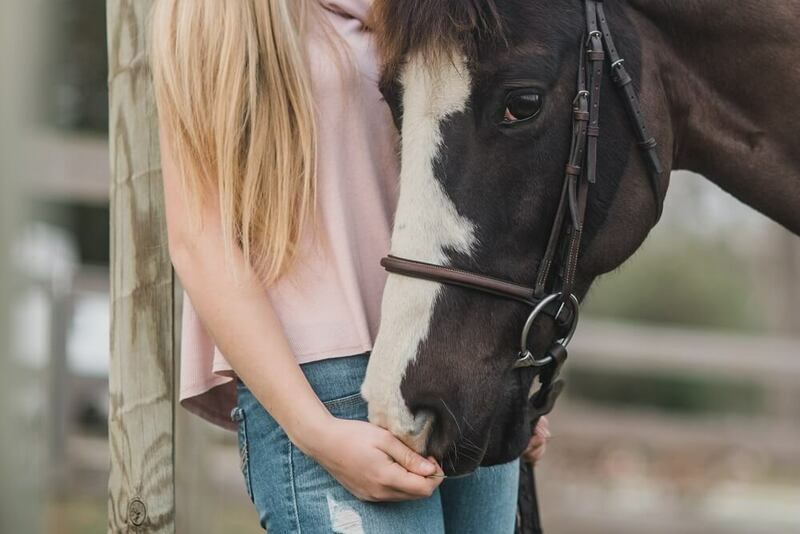 If your horse has a skin condition or already has bites or trouble with summer itch, a combination of 30 drops of tea tree oil and 30 drops of lemongrass oil is a good variation. Don’t use a full 60 drops of tea tree oil, though. It can also cause burning sensations if it is overused. Don’t use more than a teaspoonful of essential oil per quart of carrier. More will not make the spray more effective, but it can cause a lot of irritation for your horse. 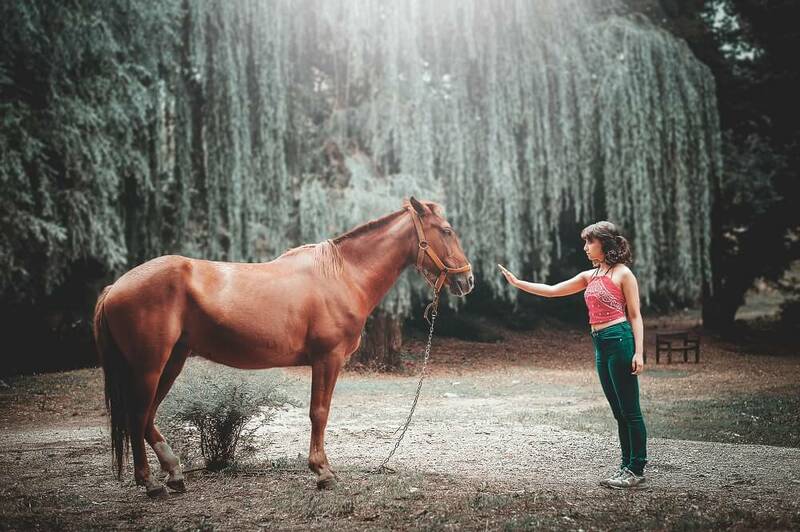 Remember that a horse’s skin is actually quite sensitive, so don’t apply undiluted essential oils to the skin. If your horse has a negative reaction to essential oils, or if the spray gets in his eye, don’t wash with water as this will just intensify the problem. Rinse with milk or vegetable oil and then rinse thoroughly with clean, cool running water. Never mix essential oils with your horse’s feed as they are only intended for external use. Check with your vet before using essential oils on your horse. Always have your horse securely tied when applying a fly spray. Choose a spot out of the wind to prevent overspray. You don’t want this mixture to spray into your eyes or your horse’s. Start high on the neck behind the head. Spray toward the back of your horse, away from the face and eyes. Work your way from neck to tail taking care to spray the lower legs and fetlocks especially well. Your goal is to have a light coating of spray over the entire body and legs. To apply to the ears and face, spray a little of the mixture on a clean, soft cloth and wipe it on carefully. Avoid contact with the eyes and nostrils. If your horse will allow it spray a little under the chin as this is an especially attractive area for some types of flies. If he won’t allow it, remember to apply some spray under the chin using your cloth. If your horse will not tolerate being sprayed, apply the mixture with a cloth or sponge. Don’t saturate the coat. You just want to lightly cover every surface. Natural sprays work for a few hours at a time, so it’s a good idea to apply this spray daily, especially before riding or handling your horse so that he won’t be distracted by flies. Don’t apply it more than a couple of times a day as excessive exposure to essential oils can be detrimental. As with all natural pest solutions, an Integrated Pest Management (IPM) approach is best. In addition to spraying your horse daily, you should also add a little food grade diatomaceous earth (DE) to his feed because it helps repel flies from horse manure. Talk with your vet about the right amount of DE for your horse. Hang a burlap bag of food grade DE in your barn so that your horse can bump up against it and dust himself with it. This light dusting helps repel flies and works to eventually reduce the fly population. Horses and cattle catch onto this cause-and-effect very quickly and make good use of their dusting stations. Use homemade fly traps to reduce your fly population. A plastic jar with an inch of ACV in the bottom and small holes punched in the lid will attract flies. They’ll be able to enter through the holes in the lid, but for some reason, they cannot figure out how to get out! Eventually, they tire and drown in the ACV. Keep your stable clean. Remove manure regularly. Empty and refill water troughs daily to prevent mosquito breeding. Feed your horse well so that he can maintain a strong immune system. Parasites of all types are more attracted to weakened animals. You may wish to purchase supplements intended to help your horse develop a resistance to flies. By keeping a healthy horse, a clean barn and pasture and using a combination of natural fly repellents and baits, you can keep your horse relatively free of pesky flies. This is a pretty good recipe that is similar to the one we have presented here. Again, don’t bother with ACV. White vinegar will work better.